Coyote populations are at an all-time high. Modern coyotes are clever and adaptive. Previously they were only found in open prairies and deserts, however nowadays Coyotes roam most forests, mountains and farmland, and have even colonized large cities. These adaptable animals will eat almost anything: rabbits, rodents, insects, reptiles, fruit, fish, deer and even dead rotten animals. Recently they have started to target lambs, calves, or other livestock, as well as family pets. You might have heard stories from friends or neighbours with sheep or other livestock killed by coyotes or other predators. 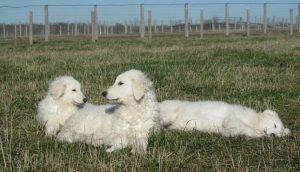 Well, let me introduce you to the KUVASZ. 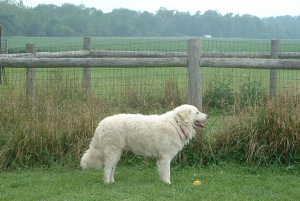 I believe that this exceptional breed of dog can watch over your herds and flocks and co-exist with the many predators that exist today (coyotes, bears, bobcats, moose). I invite you to browse through our testimonials to hear the results for yourself.